Her-Motorcycle.com Monthly, Issue 0011 Fall is the best season for riding! And welcome to the 100 or so new subscribers to Her-Motorcycle monthly - sorry that you've had to wait so long to actually receive a newsletter. I wish I could say that I've been busy riding the roads, on my bright yellow motorcycle, but that is not the case. Unfortunately, for the first time in many years, I spent my summer working, moving my husband's law office, and getting used to a new position myself. I had a few really nice rides, but not enough. I lived vicariously through you - the readers and participants on Her-Motorcycle.com. Another good thing: I've had the opportunity to meet another woman motorcycle rider - and one who also agrees that the market is a bit lacking - in terms of providing workable options for gear for women. Meet - GirlGear - Shelley, the owner, is a rider. Her jackets are designed for women who ride, and believe me - she got it right. Not only are the jackets affordable, they work - with pockets where you need them, and with zippers that work. 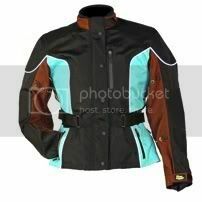 Wind resistant, waterproof, and in sizes to fit most, if not all riders. If you are a challenging size, I bet that Shelley can provide you with a jacket that will fit. Let me know what your challenges are, and we'll see what we can do. For the time being, go check out GirlGear, and let Shelley know that you are a subscriber of Her-Motorcycle.com. So, GO - enjoy the best of the riding season!